25% OFF All CAMPS & CLINICS until April 30th! This program is run at a very fast pace so get on your game-face! Run at an extremely high level of intensity pushing each athlete well beyond their comfort zone, this over speed training, along with learning proper skating and skill techniques will produce a player that will have much more speed, quickness and agility. 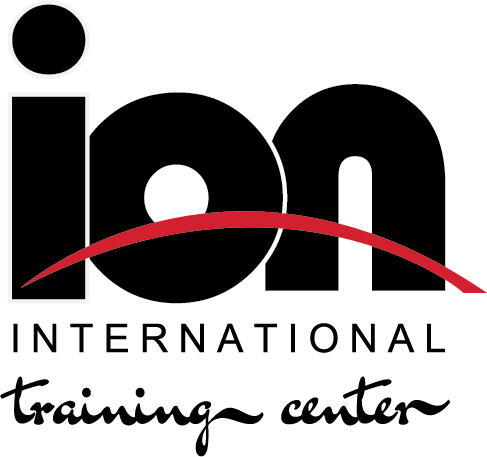 The first hour of each on ice session will be spent working on specific skating and skill development drills. The last 20 minutes will be used for competitions and scrimmage. Learn the fundamentals of skating, while having fun. This program caters to athletes with little to no skating experience. A perfect fit for first-timers to prepare for a team for the upcoming fall season. Our instructors are committed to helping your player learn to skate and overcome separation anxiety. After participating in multiple Rookie Programs, your player will be ready both physically and mentally and, on the way, to reaching his or her goals toward joining a team in the fall. The last 20 minutes will be used for fun games and scrimmage. The NHL starts here! Who cares if you can skate like the wind if you can’t handle the puck with your head-up! 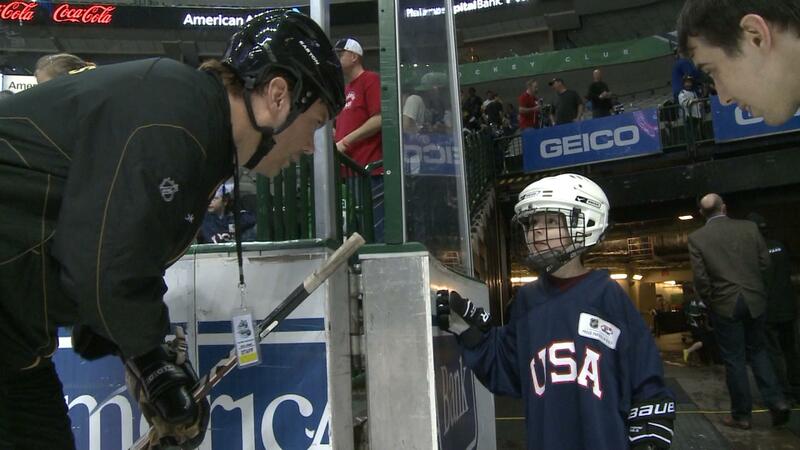 Without good stickhandling skills your hockey goals will not be reached. Develop your skills and you will be able to control your future! We will focus on and off the ice stickhandling set-up positions, reaches, pull-ins and push-outs, side dekes, pull-backs, and more. Learning modern techniques will help your athlete dominate on the ice through great instruction and repetition. The last 20 minutes will be used for competitions and scrimmage. You are in a 1 on 1 situation or against the goalie, can you get the job done and score? We will teach you in-game dekes and shooting techniques specifically designed for your skill level so you will be able to dangle and score! Our staff will be breaking down different dekes and scoring techniques on and off the ice, daily. Athletes will study and execute a specific deke and shooting technique then apply it to a 1 on 1 game situational drill. The last 20 minutes will be used for competitions and scrimmage. Goalies skate for free! If you are looking to have your athletes skating analyzed, assessed, and trained combined with visual learning, then this is it! Providing expert skating instruction with complete individual technique breakdown directly to students in real-time. Incorporate instant on ice play back to show athletes exactly what needs to be addressed. Focusing on specific skating techniques; forward stride (extension, recovery, knee bend, hand position, stance), heel stride, quick starts (walking and running on your toes), edges, power-turns, cross-overs, change of speeds, transitions, mohawks, jumps, and more. The last 20 minutes will be used for competitions and scrimmage. Does your athlete know the difference shooting off your front or back foot? What about the correct stick specs to match their skating style? We will be using the most up-to-date hockey training, techniques, and terminologies available combined with instant video break down of each player. Using modern day hockey training we can study in-game scenario shooting techniques; forward and defenseman shooting set-up positions, shooting-in-stride, quick release, fade-away, reaches, cross-over release, 10 & 2 release, tap-turn shot, and including basic shooting. Teaching these athletes how to properly apply specific shooting techniques in a game situation is truly unremarkable. The last 20 minutes of each on ice session will be used for target shooting, competitions, and scrimmage. Bottom line does your athletes have the desire to go to the next level. But, do they have the skill sets to excel in small area game situations? All players have great potential, but we want to target the exact areas they are lacking. 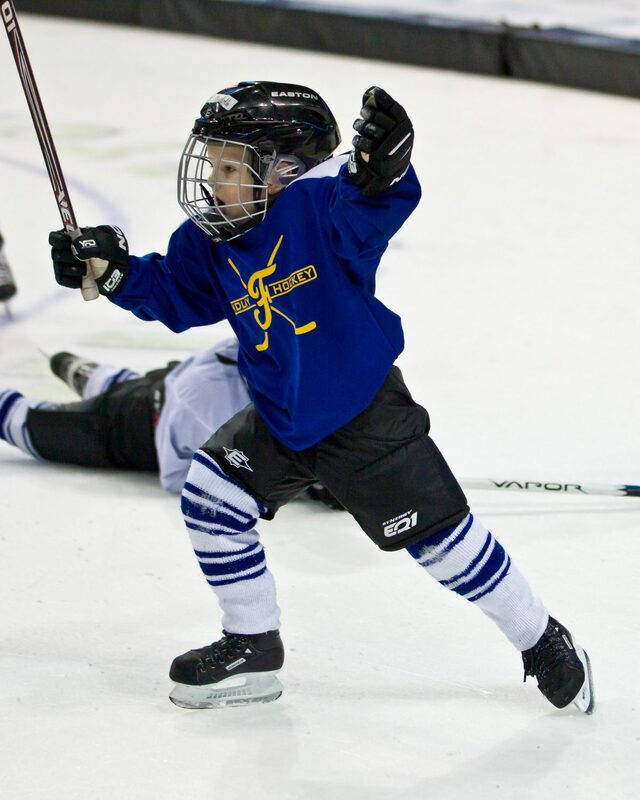 Learn the necessary skills to succeed on the ice by developing their ability to position their body properly. We will focus on the specific skill sets that translate to real game situations including safety contact. Learn the tips and tricks to finish 1 on 1 situations; in front of the net, along the boards, behind the net by using positioning, safety body contact, and other key techniques. Players will compete in competition drills, combat games, gauntlet, and will also practice the applications in game situations. The last 20 minutes will be used for competitions and scrimmage. Learn the fundamentals of skating, stickhandling, and shooting while having fun. 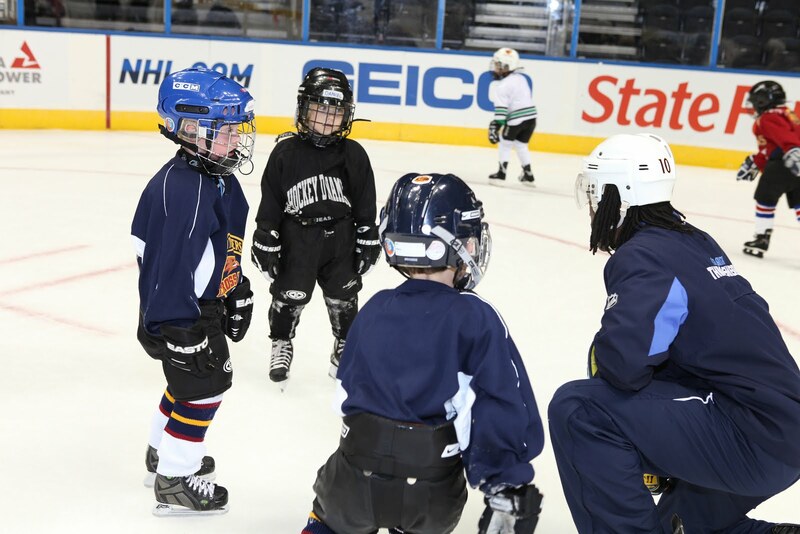 This program caters to athletes with beginner and novice skating experience. Beginner skaters will learn the proper skating techniques of marching, falling, and getting up. Novice skaters are intended to improve in their stride, edges, and stops. Players will be divided into groups by beginner and novice levels. The last 10 minutes will be used for fun games and scrimmage. Athletes will learn the fine points of passing and more importantly where to place their pass in game situations. Just as important and rewarding it is for the players to shoot well. Players will be taught; puck and delivery placement, passing routes and angles, indirect and redirect passing, saucer passing, and receiving a pass to a shot during in game drills. We will combine full-ice, in-zone, behind the net passing, shooting, and game situation drills to execute different types of shooting techniques; wrist shot, quick releases, snap shot, one-timer, tips, and back hand shot. It’s all in the execution! The last 20 minutes will be used for competitions and scrimmage. How long does your player hold on to the puck during each shift? Protecting the puck allows players to maintain puck control under pressure from a defender and control the ice. Athletes must learn and develop the necessary skill sets to succeed on the ice by developing their ability to position their body properly. Once a player is conﬁdent with puck protection techniques, we will break down the performance of individual skills to fully explain all elements of in-game scenarios a player may encounter on the ice. Proper body form is necessary in order to maximize on-ice eﬀectiveness, body control and development, both on and off the boards, and around the net. 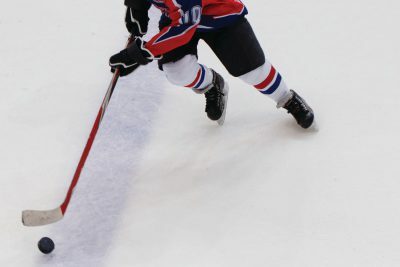 Players will target and study a specific skating, stickhandling and shooting technique then apply it to a game situation with pressure. All athletes will be pushed and expected to perform on-ice drills at game speed with game intensity. We will be using the most up-to-date hockey training techniques incorporated in each drill. Run at an extremely high level of intensity pushing the skater well beyond their comfort zone, this over speed training, along with learning proper skating and skill techniques will produce a player that will have much more speed, quickness and agility. What are the necessary skills to work on to be an eﬀective player in all situations? During this camp, we will primarily focus on stickhandling set-up positions; forehand, backhand, quarter body, cross body, and full expansion of reaches to the backhand. Include game situation drills during the training, players will be taught when and where to execute what’s being learned to a shot on net. Points of emphasis on situational shooting; quick release, follow through, shooting in stride, shooting off your back and front foot, lateral movement, yo-yo, fade-away, 10 & 2, tap-turn, and more. The last 20 minutes will be used for target shooting, competitions, and scrimmage. Checking is a skill set that takes years to develop just like skating, shooting, stickhandling, and passing. A complete game changer! Why risk injury? Is your athlete wearing the appropriate gear when it comes to physical contact? Acquire how to take and give a check along the boards, open ice, pinning, and angling. We will follow a speciﬁc progression of teaching players the correct way to make contact safe and eﬀective, separating the opponent from the puck; playing through the hands, shoulder, and full check. The skills to implement; angling, point of contact, keys to contact, receiving and execution. We will cover these checking techniques; shoulder, body block, pins, hip, transition, and angling. Checking is a fun and exciting part of the game. Our program will help your athlete take this next step. You are in a 1 on 1 situation or against the goalie, can you get the job done and score? We will teach you in-game dekes and shooting techniques specifically designed for your skill level so you will be able to execute, score, and celly! Our staff will be breaking down different dekes and scoring techniques on and off the ice, daily. Athletes will study and execute a specific deke and shooting technique then apply it to a 1 on 1 game situational drill. The last 20 minutes will be used for competitions and scrimmage. Whether you are skater or goalie looking for conditioning, to correct your stride, polish up on your edges, learn a new move or stickhandling with your head-up, then this is it! Come ready to work and be challenged! We will offer detailed instruction combined with real-time video analysis for every level of player. All players will be divided into skilled-appropriate groupings. We will be teaching different skill sets; stickhandling, skills, shooting, passing, battles, and in game positioning drills. Athletes will learn something new at every clinic, guaranteed! The last 20 minutes will be used for a 5 on 5 game. Learn the fundamentals of skating and stickhandling, while having fun. This program caters to athletes with little to no skating experience. A perfect fit for first-timers to prepare for a team for the upcoming fall season. Our instructors are committed to helping your player learn to skate and overcome separation anxiety. After participating in multiple Rookie Programs, your player will be ready both physically and mentally and, on the way, to reaching his or her goals toward joining a team in the fall. The last 20 minutes will be used for fun games and scrimmage. The NHL starts here! Saturday mornings throughout the summer, designed for athletes who want to improve and make a higher-level team in the coming season. 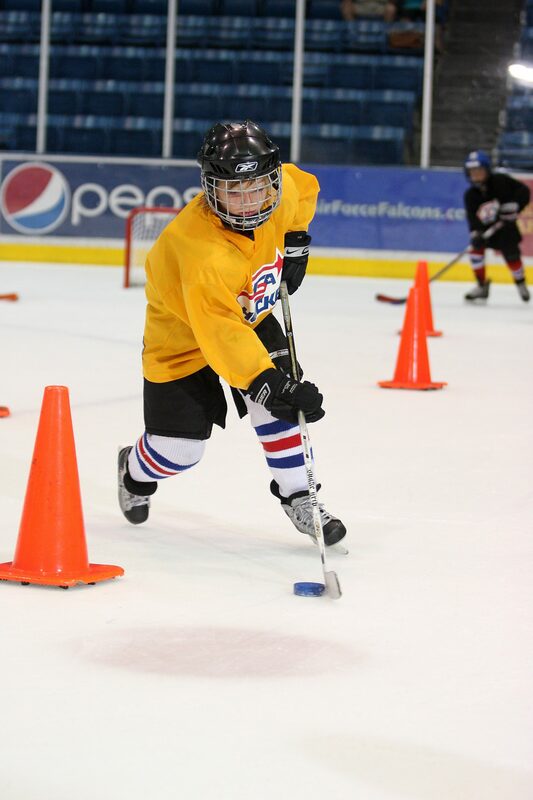 Develop individual age-specific skating and stickhandling skill sets and increase overall speed. Are you ready to accept the challenge? A great opportunity for goalies to improve their game with goalie specific development focusing on individual skill set needs. 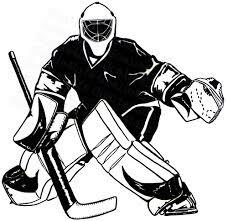 Goalies will be taught in a fun and positive environment with a ratio of no more than 3 goalies per net. These weekly clinics will allow goaltenders to develop their competitive skills in a challenging and purposeful environment. We will cater to each individual goalie with technical drills being modified based on skill level; skating, tracking, positioning, save selection, rebound control, and competing. Real-time video analysis will be provided to show athletes instant video play back reinforcing fundamentals. Younger goalies will be taught to reinforce proper skills and techniques, while the older players will be taught advanced techniques that stem from the fundamentals, including proper ball tracking and controlling rebounds. The last 20 minutes will be used for competitions. This program consists of skating only, no pucks. Balanced and controlled movements are vital to a goaltender’s growth as an athlete. The ability to move within the crease directly relates to how effective will be at stopping the puck. Practicing the movements without pucks helps the goaltenders train through repetition and develop muscle memory in order to create good habits. The addition of “Explosiveness” training helps to build our player’s strength, flexibility, and transitioning which are critical to their success on the ice. Younger goalies will be taught to reinforce proper skating fundamental techniques, while the older players will be taught advanced techniques that stem from the fundamentals. 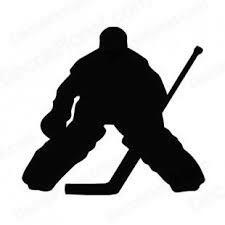 Our 3 on 3 leagues are designed to promote fun, high paced hockey action. Players are rewarded with more puck touches and scoring chances. It's a great way to play the game "on the fly" creating quick hands, quick skating and quick thinking! Learn the fundamentals of skating, stickhandling, and shooting while having fun. 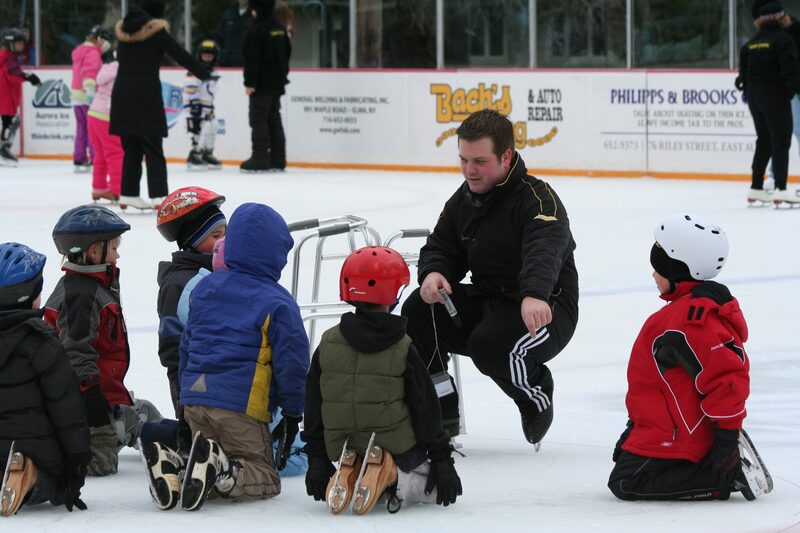 This program caters to athletes with beginner and novice skating experience. Beginner skaters will learn the proper skating techniques of marching, falling, and getting up. Novice skaters are intended to improve in their skating (stride, edges, and stops) and stickhandling (set-up positions and puck control). Players will be divided into groups by beginner and novice levels. The last 15 minutes will be used for fun games and scrimmage.